February is the month when love is in the air, and everybody is overwhelmed with romance. Partying is irrefutable, and the right location such as an Event Venue in Brooklyn, New York can speak to your heart with astonishing arrangements, decorations, palatable finger-licking cuisines for guests to savor along with fun activities can make your party memorable. Five things a Catering Hall in Brooklyn, New York can do for you to let this Valentine’s Day party imbued with love. You can be in any stage of your relationship, selecting a theme would help you to create a feeling of fun, friendship and love. You can select one from a myriad of themes suggested by managers. The themes also include Valentine’s Day themed weddings, office staff and employees, friends, singles, and your beloved, etc. The decorations will follow the theme of the party. Apart from red heart-shaped balloons, red table covers, head boppers, cupid cut-outs, heart swirls, and red roses you can also personalize the decorations with banners, centre pieces, sign-in boards, photo booths, a life-size cutout, etc. You might have heard your granny saying, “The way to the heart is through the stomach.” The management staff at a great Catering Hall in Brooklyn, New York keeps this in mind and put their most delicious food on the table. You can also seek suggestions about the menu and discuss your preferences with them. You can select the activities according to your theme. There are different kinds of activities for kids and adults. This is the significant benefit of hosting a party in a catering hall instead of the home is that you can enjoy unique and exciting activities without the worry of clean-up. They also understand that a romantic mood is key and will play relevant songs which will enthrall you and your guests. A unique party favor will help your guests remember the memorable moments of the party even after the festivities have ended. You can also personalize the favors and present them to the guests as part of their party experience. Booking a great Event Venue in Brooklyn, New York would help you to make this Valentine’s Day party the best it can be. Garner some memories from the moments you’ll share to make you feel love and romance for the rest of the year. “Organizing a corporate event” – It may seem like a simple request to handle, but the many decisions you have to make while arranging a corporate event can make it a hectic experience. Among others choosing a corporate meeting venue is the first and foremost decision. It will have a crucial impact on the event planning. Is the event date available, what are the catering options, how is the food, will attendees enjoy the experience. These are just a few of the corporate event planning decisions that are affected by venue selection. The earlier you choose a corporate event venue, the better your event options will be. Budget, space requirement and event size estimation are the prime considerations. You should have a thorough understanding of what you need before you start searching for a corporate conference venue. An advanced booking 3-6 months early will give you the peace of mind and needed time to arrange other crucial event planning options, such as a corporate catering service, preparation of guest invitations, presentation or themed materials and others. Careful consideration of venue location, available parking, venue capacity, corporate catering charges, food & beverage, service quality, available amenities, venue event activities, layout selection, ambiance of the location, accessibility, acoustics, and conference venue costs are just a few important considerations that can greatly affect the success of your next corporate event. A professional event planning service can help you to arrange and manage all of the above mentioned factors easily and effectively within your timeframe and budget. Planning to Select a Corporate Meeting Venue in Brooklyn? 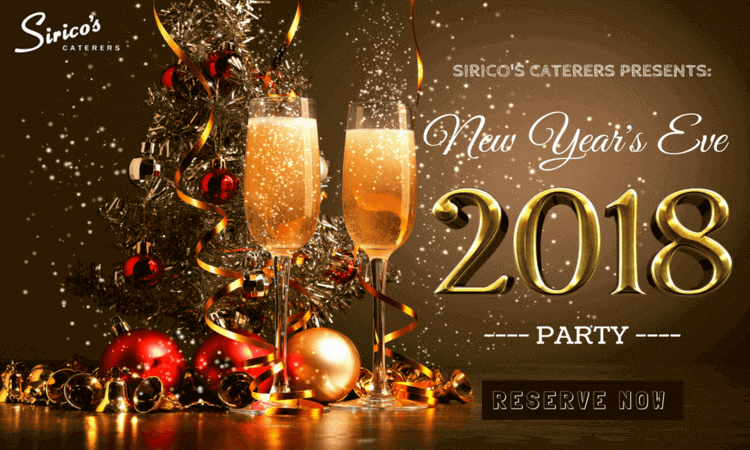 Why Sirico’s Caterers Should Be Your First Choice! Brooklyn, NY is not an easy place to book a corporate event venue. Due to high demand & continuously rising cost for event venues in Brooklyn, NY; it’s near to impossible to reserve a high end corporate event catering service provider here with your prefixed budget… not anymore! At Sirico’s Caterers, searchers of top notch corporate meeting venues in Brooklyn can get what they have been looking for. 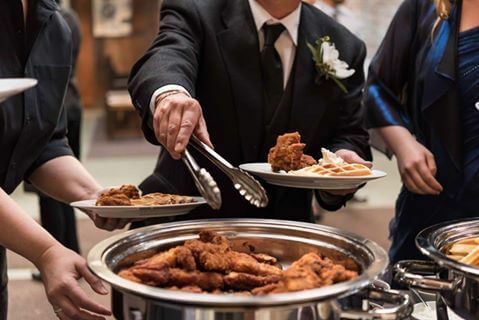 From luxury amenities to exclusive conference venues, proficient event planning services, and the finest corporate catering services in Brooklyn, NY; Sirico’s is an all-in-all and deluxe corporate event catering facility that will fit within your budget. 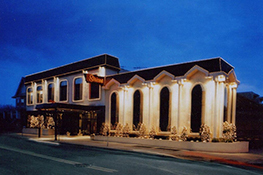 The highly elegant corporate meeting venues, multiple selections of banquet halls, friendly, well-mannered & trained staffs, and most of all the convenient location of our venues right in the heart of Brooklyn, NY makes Sirico’s undoubtedly the ultimate choice for your next corporate event venue. From 1925, Sirico’s Caterers has been the top choice for event planners for both corporate and social events. Let Sirico’s serve your corporate event needs, and we will serve beyond your expectations while taking best care of your event needs. For corporate event planning, venue booking, & catering services; give us a ring at (718) 331-2900 right now. You can also check our website at https://siricos.net to get more exciting details on our services. When you’re hosting a party, you’re not only inviting people but responsibilities also. In a fast-moving city like Brooklyn, it can become a burdensome task to find a suitable venue from various Brooklyn Catering Halls, that will satisfy your taste and bring a smile to everyone’s face. Whether it is a birthday party or a retirement event, wedding reception or a corporate meeting, there’s a responsibility of the organizer to ensure that everything falls into place. 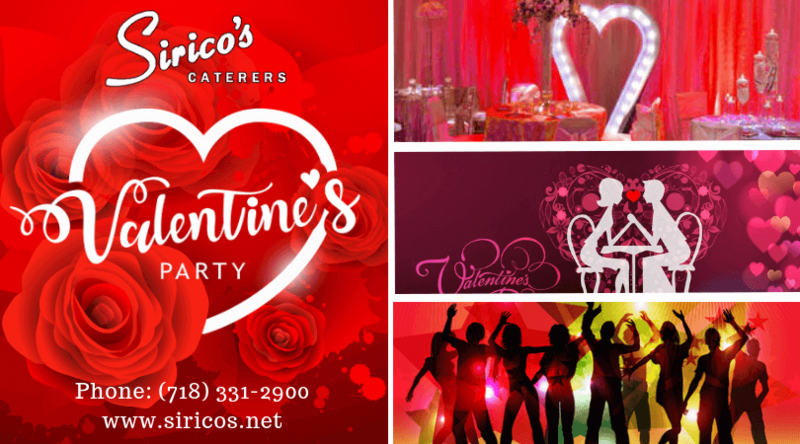 SIRICO’S is an event planning and catering service organization that proves to be a final destination for savvy party planners and event organizers whenever they are hosting any kind of social gathering. 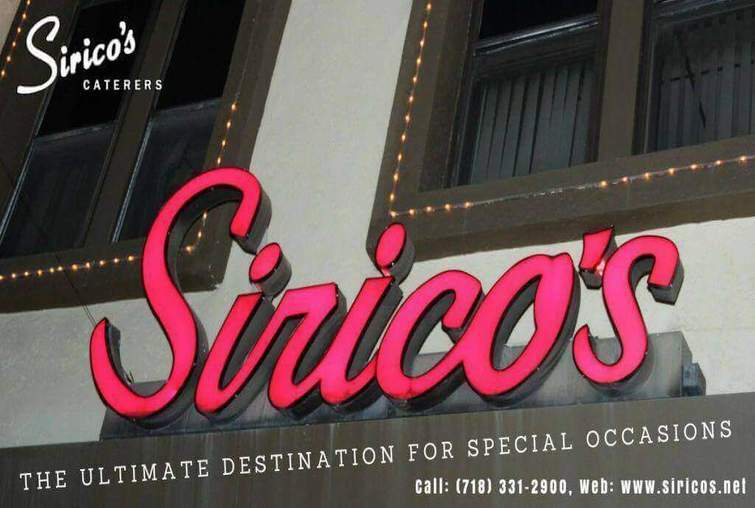 SIRICO’S, not only promises to provide spectacular food and excellent service but also to add charm and elegance to the memories you’re creating. What brings sparkles to one’s eye better than the cuisine at an event? Parties are incomplete without the presence of mouth-watering cuisine and a diverse menu. 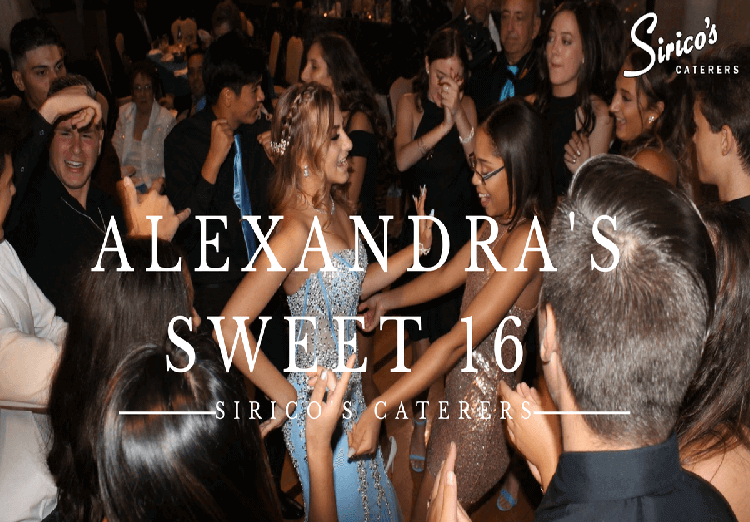 SIRICO’S, being one of the best catering services in Brooklyn, NY, offers organizers a delightful multi-course menu to choose from as per the requirement of the occasion at affordable prices. While checking in on an occasion, people often find themselves fussing with the Google maps to trace the correct location. Well, SIRICO’S won’t give you or your guests any such problem since; it is located at a very easy to address in Dyker Heights Brooklyn. SIRICO’S offers 3 aesthetic and alluring banquet halls that can be customized and decorated as per the requirement of the event. All three halls are beautifully designed with style and elegance with enough space to be able to host a huge gathering. Of all the beautiful Brooklyn Wedding Venues that are generally extravagant to one’s pocket, SIRICO’S is an exception as we provide exquisite venues and expert services all at reasonable prices. SIRICO’s has a cooperative team of devoted members that work with immense dedication to weave the dreams of a perfect plan into every occasion. This type of dedication provides you with long lasting memories and a smooth stress-free event. 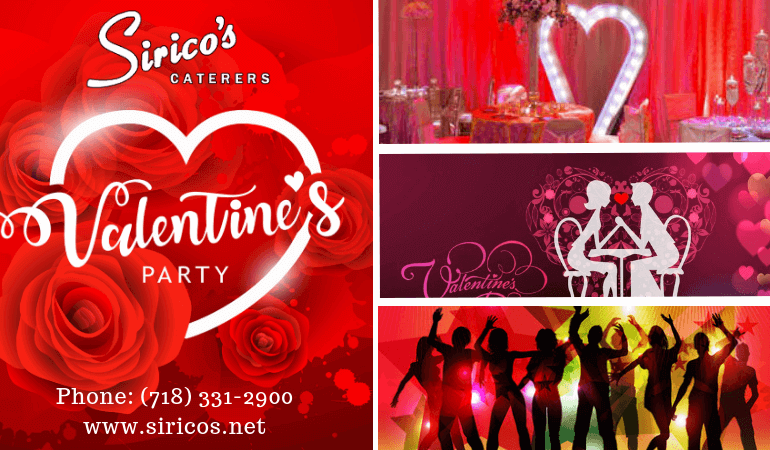 Lastly, the best thing that SIRICO’S offers is help planning your perfect occasion. 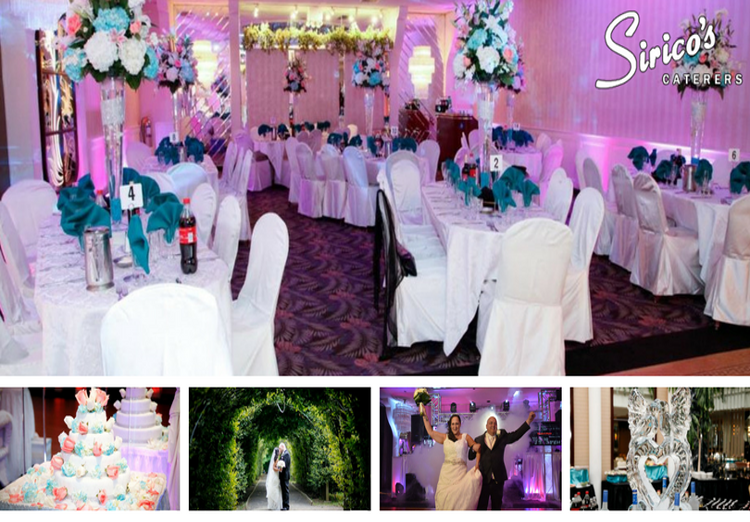 If you’re searching for the dream location for your wedding, SIRICO’S is the perfect venue for you. Of all the wedding reception venues in Brooklyn, NY. SIRICO’S proves to be a promising and alluring choice because of their affluent services and planning expertise. SIRICO’S proves to be a perfect choice for corporate clients as well. The event planners ensure you a healthy, well appointed atmosphere by providing the most reliable corporate catering services in Brooklyn, NY. Since SIRICO’S provides a full range of impressive services, you can put their faith in the experts who specialize in providing exquisite service for your dream occasion sealed in perfection. 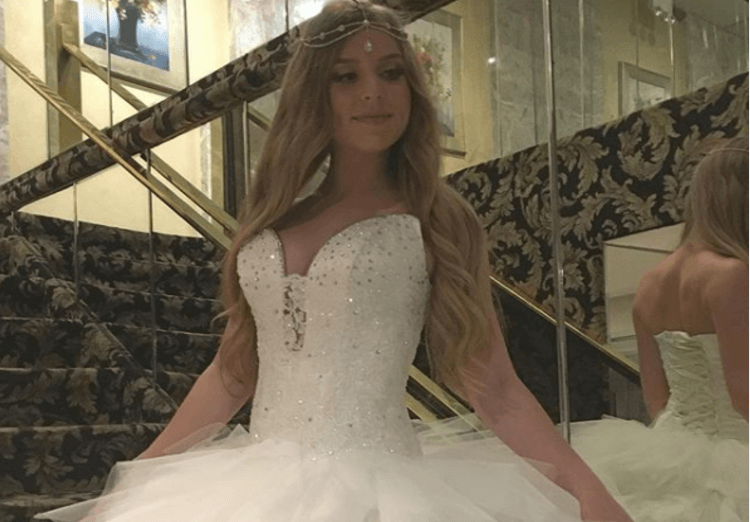 So, if you’re soon getting hitched or are a potential organizer for an occasion, believe in the services of SIRICO’s, for they serve happiness to every guest. As Mother’s Day is just few days away, most of us are getting prepared to make the super-lady in our life feel appreciated. Whether you choose a gift, tour her around the city, write a heartfelt note, or help her around the house; your Mother’s Day surprise must come from the heart. It doesn’t need to be complicated, extravagant or expensive, but it should be heart-touching and thoughtful. We have prepared a full Mother’s Day plan for you to surprise your mums in the best possible way. So, let’s get started with our plan. Show that you appreciate her hard work by spoiling her for the day. Give her the chance to relax and enjoy her morning coffee with breakfast in bed.Let someone else in the family take care of her Daley chores for the day. Also, don’t forget to bring her some fresh, aromatic, colorful flowers for the decor. Nothing will surprise her more than a flashback of your favorite memories with your her. Search for souvenirs, photos, mementos, of special treasured moments with your mom. tell her how those memories with her have impacted your life, and make sure that the most important lady in your life knows that you value your time together with her. Although making a special meal on your own is a great idea, what if your culinary skills aren’t up to par. Well worry not; we have the perfect plan for you. How about booking a special Mother’s Day dinner for her? This Mother’s Day, Sirico’s Caterers is arranging a wonderful dining event for your special lady featuring exclusive Italian Cuisines, Viennese Table, Carving Station and Salad Bar. The excellent menu options will delight your mom on her special day. Sirico’s will present a five-star dining experience and so much more. Doesn’t it sound fantastic? 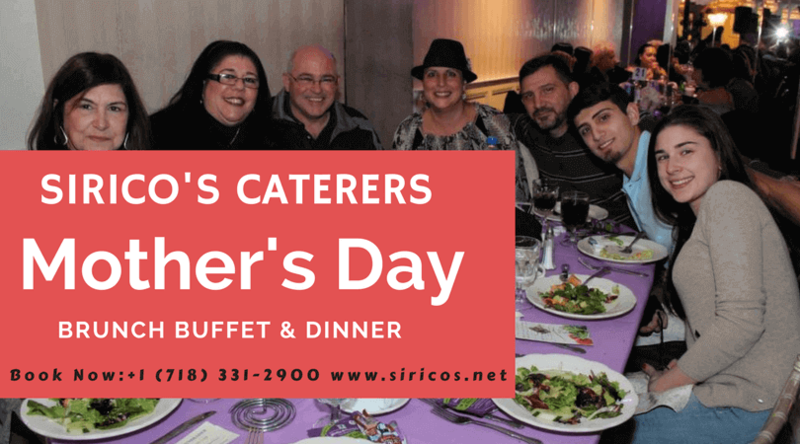 You can book Sirico’s special Mother’s Day Buffet with just a call to 718-331-2900. The best thing is you don’t have to spend a huge amount of money to surprise your mom on her special day. Just pay a small amount of $45/adult and $25/children and enjoy a five-star buffet with your family and friends. And to finish off the day, hand her a heart-warming Mother’s Day note hand written by you. Be thoughtful, your special note doesn’t need to be wordy or complex. Tell her how much you love her and a few reasons why you appreciate her. Well, that’s all from our side. 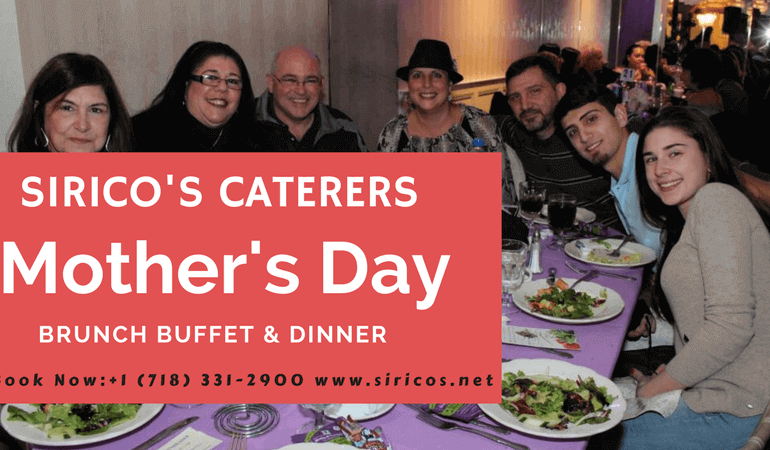 Start early, plan your surprise for Mother’s Day, and don’t forget to book your unlimited deluxe buffet at Sirico’s today. 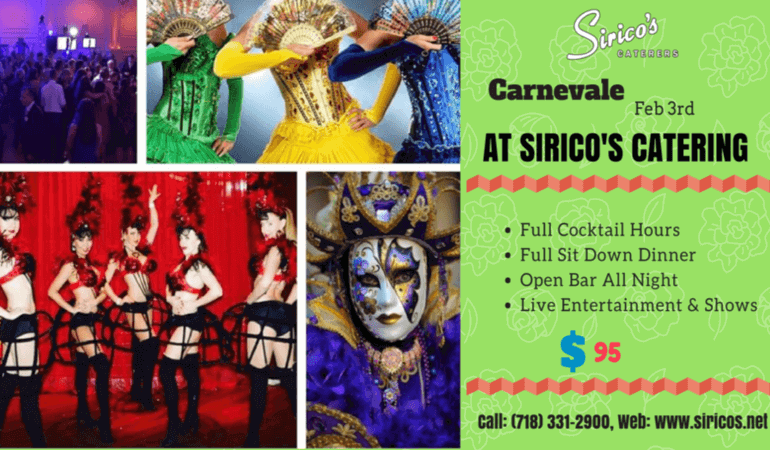 On Feb 3rd, 2018, Sirico’s is hosting a spectacular, joyful event of dining and dancing to celebrate the Carnevale with the famous The Caleps DJ’s. Delight your friends and family with an evening of fun and laughter at this annual Mardi Gras event that Sirico’s is hosting in conjunction with The Caleps Entertainment Group. What is a Carnevale Event? Carnevale is also known as mardi grass event. This is an annual event, which is celebrated 40 days before Easter and considered as a final party before Ash Wednesday. Carnevale event marks the beginning of Lent (the period of 40 days before Easter) during which no meat is eaten. The Caleps Entertainment Group is an extraordinary entertainment company in Brooklyn NY. They are the experts in arranging lively and enjoyable entertainment for all occasions. Sirico’s has earned an outstanding reputation as an elegant party venue in Brooklyn NY. Our beautiful event venue is known for providing decades of quality service, excellent menu options and fun exciting events. Siricos is the best choice for entertaining parties, celebrations and wedding receptions in Brooklyn NY. Do you want to be a part of the Annual Carnevale or Mardi Gras Event in Brooklyn, NY? 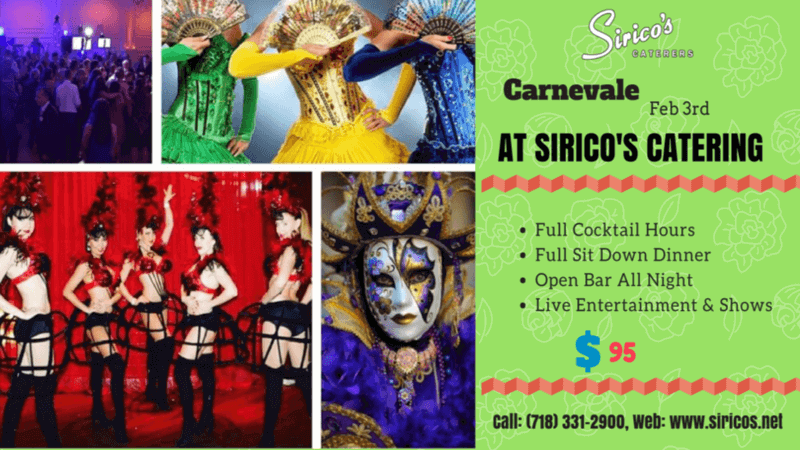 To be a part of The Caleps Entertainment Annual Carnevale Mardi Gras Event, make sure to book the tickets and group tables today by contacting Sirico’s at 718-331-2900! Act now to make your Carnevale celebration night memorable, entertaining and enjoyable. Limited Seating!! Call Today! Visit www.siricos.net.